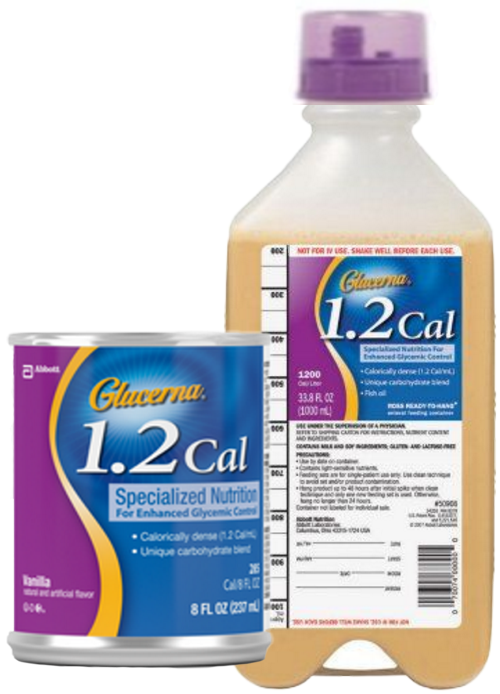 GLUCERNA 1.2 Cal Specialized Nutrition for Enhanced Glycemic Control, is unique calorie dense formula for patients with diabetes and hyperglycemia. It's available in 8 oz Ready-to-Drink Can in vanilla flavor or 1000 mL unflavored Ready-to-Hang Bottle. This formula is developed by Abbott Nutrition with a unique fat and carbohydrate blend called CarbSteady® containing slowly digestible carbohydrates clinically shown to help minimize blood glucose response that's very helpful for type 1 and type 2 diabetes. It also has chromium, an essential nutrient important for carbohydrate metabolism. These properties also make it ideal for patients with hyperglycemia/abnormal glucose tolerance resulting from metabolic stress, such as illness, trauma or infection. It's been clinically shown to significantly reduce peak postprandial blood glucose response by 49 mg/dL and reduce glycemic variability when compared with standard 1.2 Cal formulas for people with diabetes. Protein promotes anabolism and supports wound healing. 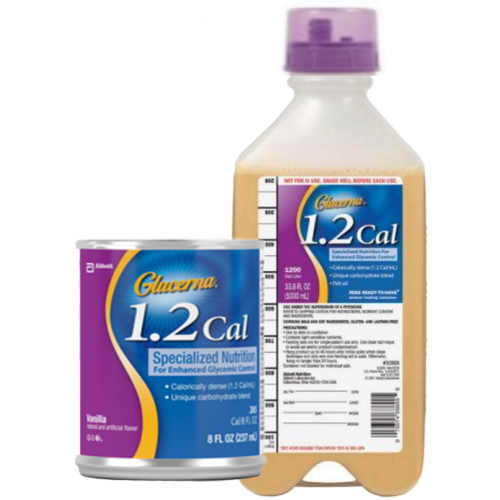 One serving of GLUCERNA 1.2 from either the 8 oz Can or from the 1000 mL Bottle will keep that in check with 20 percent of its calories from protein. It's also heart healthy with NutraFlora® scFOS® comprising four percent of total calories from saturated fatty acids and rich in monounsaturated fatty acids, consistent with the American Heart Association and American Diabetes Association guidelines. To support cardiovascular health, omega-3 fatty acids are plant based from canola oil and EPA and DHA omega-3 fatty acids are derived from fish oil, also consistent with American Heart Association guidelines. GLUCERNA 1.2 also provides 24 key vitamins and minerals. 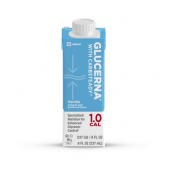 Glucerna 1.2 Cal is ready-to-use and can be consumed as supplemental or sole-source nutrition and allows users to obtain the 1.2 Cal per mL requirement with less volume. The 8 oz vanilla flavored Glucerna 1.2 is great tasting and can be consumed at room temperature or chilled. The 8 oz can portion can be used for tube feeding at room temperature or the 1000 mL Ready-to-Hang Bottle designed with a bottom ring for easy hanging. Make sure to follow instructions to use to reduce microbial contamination for safer consumption. 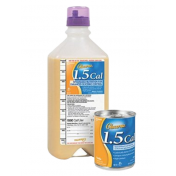 GLUCERNA 1.2 Cal is compatible with many intolerances and religious food laws. It's Kosher, Halal, gluten-free, and is suitable for lactose intolerance. You may also be interested in Glucerna 1.0 with added fiber. Formulation is specialized for patients with type 1 or type 2 diabetes. Formulation is for patients with hyperglycemia or abnormal glucose tolerance. Not to be consumed if user has a galactosemia allergy. Water, Sodium Caseinate, Corn Maltodextrin, High Oleic Safflower Oil, Canola Oil, Isomaltulose, Fructose, Soy Protein Isolate, Sucromalt, Short-Chain Fructooligosaccharides, Glycerine, Milk Protein Concentrate, Oat Fiber, Soy Lecithin, Soy Fiber, Potassium Citrate, Magnesium Phosphate, Natural & Artificial Flavor, Potassium Chloride, m-Inositol, Calcium Carbonate, Calcium Citrate, Sodium Citrate, Ascorbic Acid, Choline Chloride, Salt, L-Carnitine, Taurine, Carrageenan, Ferrous Sulfate, dl-Alpha-Tocopheryl Acetate, Zinc Sulfate, Niacinamide, Calcium Pantothenate, Manganese Sulfate, Cupric Sulfate, Vitamin A Palmitate, Thiamine Chloride Hydrochloride, Pyridoxine Hydrochloride, Beta-Carotene, Riboflavin, Chromium Picolinate, Folic Acid, Biotin, Sodium Molybdate, Sodium Selenate, Potassium Iodide, Phylloquinone, Cyanocobalamin, and Vitamin D3. Contains milk and soy ingredients. Drank in moderation, it controlled the fast reaction of heart and other hyper related stresses caused by food. It balanced heart and slowed metabolism, as it is slow in digestion.